We have made it easier to discover BBs from over 40 different brands to help you find where to buy them, local or worldwide. 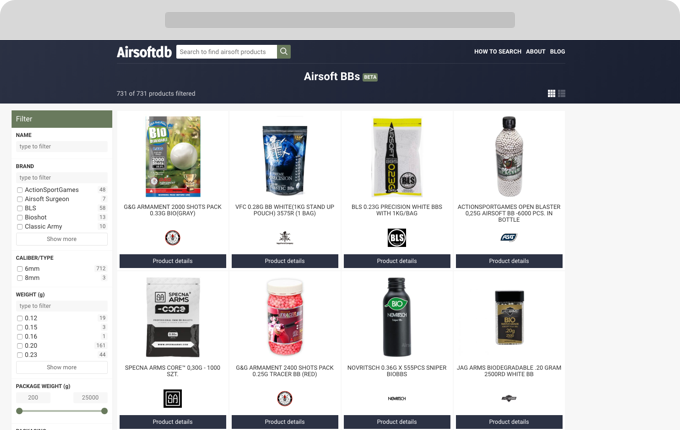 With Airsoftdb you can search and find airsoft products from your local shop and stores worldwide from one place instead of visiting many webshops one by one to manually to find what you are looking for. * We try to detect your location and give you the first search results of products from shops in your country (or state if you are in the U.S.) if available. ** We are trying to ensure that all stock status are correct. If you see any incorrect information, please let us know.